Everything’s better with an egg on it, right? Eggs are a staple in my house, and probably in most houses too! They’re a great source of natural protein and I try to include them in my daily life as much as possible. I recently got my hands on these Great Day Farms Hard Boiled Eggs, and let me just say… I’m sold! These eggs are always perfectly hard boiled with the most beautiful yellow centers you’ve ever seen. Plus… I don’t have to peel them! 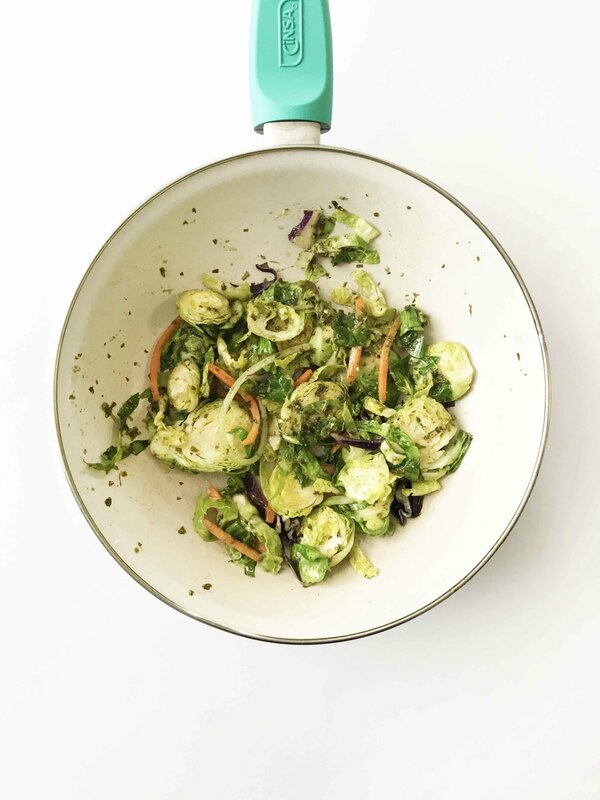 This bowl is perfect for meal prepping, especially if you choose to keep the shredded greens cold and crisp. Though honestly, I prefer them to be wilted! That could be because it’s winter though and I’ll likely change my tune about that come Spring or Summer. That brings me to another point. The bowl here is perfect YEAR ROUND. Feel free to change it up with homemade pesto in the Spring and Summer when fresh basil is a plenty. Or warm up the greens in the winter if you’re looking for a warm lunch instead of cool and crunchy. I tend to change the mixed greens up that I use with this bowl all the time. Usually according to what I have on hand. Today it was brussels, kale, cabbage, and a few bites of carrot for the most part. Spinach with be another really good option here. Serve this bowl warm or cold. 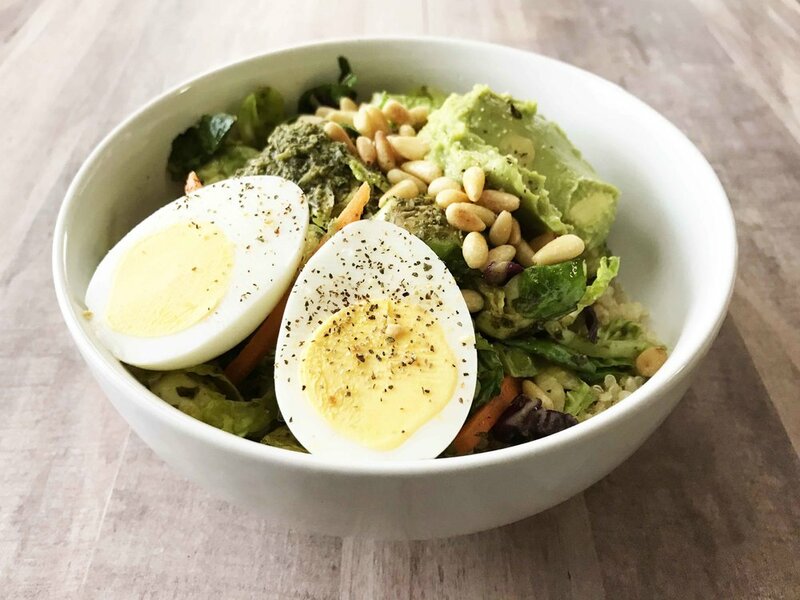 Layers of quinoa, greens, avocado, pesto, pine nuts, and even an egg on top! Warm a small skillet over medium heat and add in the 1 C. mixed greens and 1 Tbsp. of the pesto. Cook for 3-5 minutes or just until the greens are wilted slightly. Place the 1/2 C. cooked quinoa into the base of a bowl and top with the cooked greens. Add on the 2 Tbsp. mashed avocado, 1 Tbsp. toasted pinenuts, the remaining 1 Tbsp. pesto, and the halved Great Day Farms Egg. Season with any salt and pepper as desired and serve right away to enjoy!